← Major Midget Rep – Smiths Falls Champs! 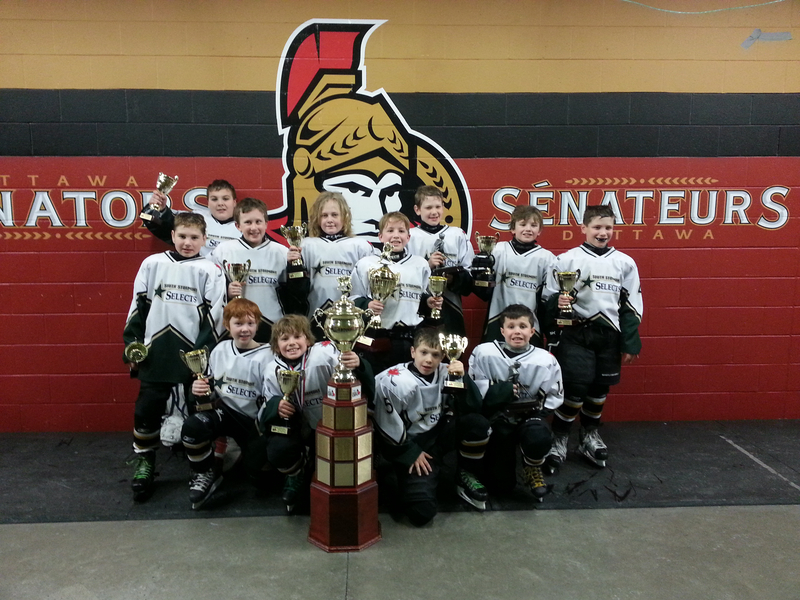 Atom B Selects – Bell Capital Cup Champions! If you asked a peewee or atom hockey team the best way to end a year and start a new one, they most likely would say by doing well at the Bell Capital Cup. The South Stormont Selects Atom B team didn’t just do well at the 2013/14 instalment of this international mega-tournament, they dominated. At the end of the tournament 48 teams in their division left the Ottawa area “empty handed”, while the Selects Atom B left as champions. To paint an accurate picture of the kind of tournament the South Stormont athletes have had requires one to look at the statistics. 5 days of hockey played. The longest winning streak of their division with seven games and seven wins. Of those seven games, five were shutouts, including the championship against the Kempville Panthers . Four out of the top ten points leaders came from the Long Sault rink, led by Matt Doyon with 16 points for the tournament. Longest points streak record of the tournament for their division is held by Griffin Charlebois (at seven games). On the defensive end, only four goals made it past stellar net minders Jayden Bowen and Sam Pineault. Round robin play was completed at the Jack Charron Arena in Napean. There, the team of twelve boys ranging in age from 9-10 years old, they dispatched of their division in three uneven games. The Arnprior Avalanche, Letrim Hawks and Napean Cobras all left the ice without netting a point. Playoffs moved the team to the Bell Sensplex where the team silenced the Napean Mustangs 9-0, the North Dundas Demons 8-2 and the Jets de la Lievre 3-2. The quarter finals and semi finals played on New Years eve day saw teams finally netting pucks against the Selects, but not enough to stop the team’s momentum. Finals were played at the Canadian Tire Center. The Selects played a composed game and returned to form, shutting out the last Kempville Panthers team standing 3-0. In the skills competition the Selects Atom B brought home hardware in the skating relay and the puck agility relay. William Holmes, Jake Esdale and Kason Martel, pulled from behind to win the agility relay. Matt Doyon, Keaton Racine, Chase Duchesne, Griffin Charlebois and Devon Villeneuve dominated the skating relay, managing to pass a team in the elimination rounds, to take the title for this year’s competition. The Selects Atom B team was coached by Head Coach James Racine, Assistant Coaches Greg Esdale, Lee Charlebois and Trainer Peter Bowen. Behind the scenes Barb Doyon, team manager, worked to make sure everythig ran smoothly for the team. South Stormont also fielded two other teams at the BCC. Two Atom C teams made it through round robin undefeated, only to meet in the Quarter finals. The C1 team fell to the C2 team in a game that was decided by an overtime goal. The C2 teams run came to an end in the semi-finals against a Kempville Panthers entry. This entry was posted in News and tagged Atom, B House, Bell Capital Cup, Champs, Gold, south stormont minor hockey, Tournament. Bookmark the permalink.